Mark Mulder is giving it one more shot at a comeback. Mark Mulder may not have hung up the cleats after all. 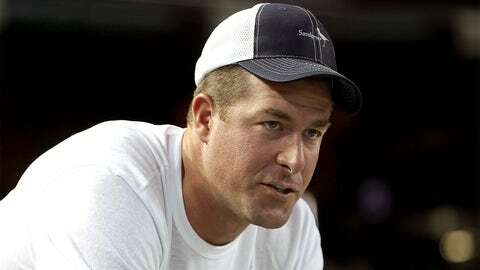 The former Athletics and Cardinals pitcher is attempting a comeback after retiring in 2009. The star left-hander underwent two surgeries in 2006 and 2007 on his left shoulder that left him struggling to be the dominant pitcher he once was. From 2006-2008, the two-time All Star pitched in only 23 games, prompting him to throw in the towel at just 32 years of age and become another victim of the "what if" game that can haunt the greats. Now, Mulder may be answering that question himself. After retiring, Mulder began working as an analyst at ESPN, but he has decided to put his broadcasting career on hold in order to see if he still has what it takes to pitch in the big leagues. ESPN’s Jerry Crasnick is reporting that Mulder’s change of heart can be attributed to an unlikely source: Dodgers reliever Paco Rodriguez. "I can’t even begin to tell you how excited I am," Mulder said by phone Tuesday. "To be honest with you, I never anticipated this five or six weeks ago. It was just a flat-out fluke that came from me trying to imitate Paco Rodriguez in my living room." Mulder saw something in Rodriguez’s delivery that he began incorporating into his own throwing style. Rodriguez separates his hands up close to his head before delivering the ball rather than Mulder who used to separate down closer to his midsection. And now, after working to get himself back in shape, he says that scouts have clocked his fastball at 89-90 mph. "The best way to describe it is, the ball is coming out of my hand better now than at any point when I was in St. Louis," Mulder said. "I wouldn’t be trying this is if I didn’t think the stuff I was throwing was good enough (to pitch in the big leagues)." Mulder has reportedly thrown off the mound for three unspecified teams already, and he’s hoping to throw for more with the ultimate goal of landing an invitation to a spring training camp.